The following is an excerpt from a Walton fan in Melbourne, Florida who wrote in the Waltons Digest 34-2000 by Karen Kearney. I am Marie Walker Bradley. Helen is my first name, but I go by Marie. I didn't just surface. I have been around for 71 years, but only got my iopener in March, and have kept playing at it till I one day ran across the Waltons. I was so very excited. I was born in Schuyler, Virginia and our house was the one next to the Earl Hamner home. The two houses are pretty close together. When I was 6, my dad passed away, and we moved south to Lovingston, Va. to live with my grand parents. I would give anything if I could share some things with you but I just don't remember anything that would be of too much interest to you. After my husband retired from the Gov. 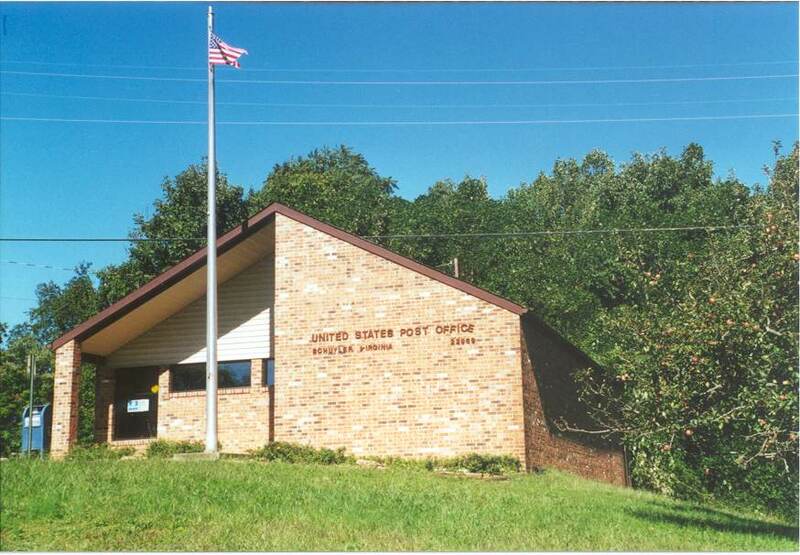 in 1981, we moved to the valley, Waynesboro, Virginia.We made several trips to Schuyler, Va. I have real good pictures of both of the homes, and I have a good one of Mrs. Hamner setting on her porch. In the post office hangs my Granddaddy Schuyler Walker's picture. Schuyler was named after him. If you are ever in Schuyler, go inside the post office and see him. He has the long beard and handle bar mustache. Turning off of Highway 29 onto Rockfish River Road, also known as Route 617, I meandered along the Rockfish River as I drive toward Schuyler, Virginia. Along the way I passed through the village of Rockfish and over the railroad tracks that travel among the town. I barely miss a glimpse of the river as it keeps me company on my travels toward Schuyler. Following Route 617 (also known as the Rockfish River Road) is the Rockfish River. The river begins in the foothills of Three Ridge Mountains in the community of Beech Grove. 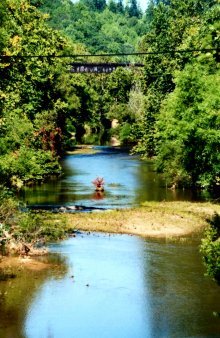 It gently flows through the communities of Adial, Woods Mill, Rockfish, Schuyler, and Howardsville, where it joins the James River near Scottsville. "Outside, the night was filled with sound. The high mechanical screech of the cicadas was a metallic din which gradually whined into silence. A turtle dove called. His mate answered, far off, and then her voice sounded again and his voice cried out, closer now. In the distance, flowing over the pine trees, from the swamp, over the pond, came the thousand-voice choir of frogs. Once only came the saddest sound in the world, the single unanswered voice of a whippoorwill, but there was no one to hear it. Everyone in the house was asleep." The Nelson & Albemarle Railway operated a line of about 17 miles that extended from a connection with the Southern Railway at Rockfish, Virginia and ran eastward through Schuyler and Estmont up to Alberene, location of the old Alberene Stone Company. The purpose of the N&A was to serve the soapstone quarries located in the Virginia counties of Nelson and Albemarle, and also the company plant at Schuyler. My car sits in front of the Rockfish depot as I take the photograph. John-Boy would often write about hearing the lonely sound of the train whistle as the train crosses the trestle at Rockfish. This photograph shows the trestle at Rockfish as it appears while I face away from the village. Only a few houses now stand within the town. The abandoned depot now stands as a reminder of a time long gone but not forgotten. 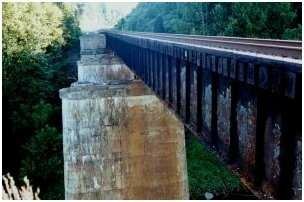 As I took my photographs of the trestle I could almost see a young Earl Hamner walk these lands with his younger brothers and sisters following behind him. The Schuyler Family Restaurant was located right next to the Walton's Mountain Museum. (However it is now closed.) Located within the restaurant, at the time of my visit, was "Walton's Mountain Gifts & Souvenirs". A delicious barbecue sandwich was served at lunchtime along with submarine sandwiches, hamburgers, and other homelike fare. My Wednesday dinner consisted of a wonderful - highly recommended - baked vegetarian ziti pasta served with salad and bread. The building was originally the first high school in Schuyler. The Conflict is an outdoor drama based on a special episode of The Waltons. It is the summer of 1936. John Walton's cousin Boone and Boone's grandson, Wade, arrive at Walton's Mountain with a call to arms. Their land high in the Blue Ridge has just been condemned to make way for the Blue Ridge Parkway, and they have been told to "pack up and relocate". But Boone's mother, Martha Corinne is determined to stay and fight, and Boone carries a message for Grandpa, John, and John-Boy: "You come up there to fight. You be there. Tomorrow...Bring your rifles." 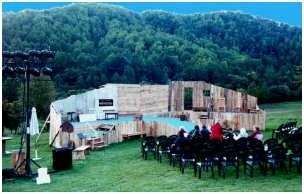 The play is performed at the Mountain Cove Vineyards and Winegarden. This outdoor setting is located in the foothills of the Blue Ridge Mountains, within view of the ridges where the story takes place, and 12 miles from Schuyler, the boyhood home of Earl Hamner and the Walton's Mountain Museum. For reservations and to learn more about the various things to do in beautiful Nelson county, call the Nelson Country Department of Tourism at 800-282-8223. 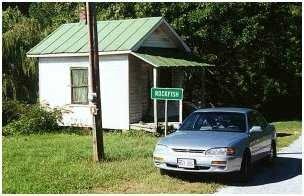 They are located in Lovingston, Virginia. A wonderful place to stay while visiting Nelson county is the Village Inn located in Lovingston, just a few miles from the play. It is "a new place with old world charm" and can be found at Village Inn Lovingston. The stage is set for settings within a five-day period at locations (1) along the ridgeline road, (2) John Walton's home on Walton's Mountain, (3) Martha Corinne's mountain homestead and nearby woods, and (4) the Government house. The play was adapted for the stage by Jeb Rosebrook, based on his 1974 teleplay and special episode of The Waltons the acclaimed TV series created by native son Earl Hamner, Jr. It was directed by Boomie Pedersen, produced by Christopher Baumer, and presented by special arrangement with Warner Brothers. I thoroughly enjoyed the play and highly recommend it to Walton's fans. Even though I am quite biased about my strong interest for The Waltons, even people without much knowledge of the TV series would enjoy the quality, professional acting and the historical conflict that is portrayed during the play between technological progress and an established way-of-life. My two-day Walton's experience to Schuyler and the surrounding area was very enjoyable to me. As the people of the Walton's Mountain Museum say, "We hope you enjoy your visit and take with you the feeling that most visitors seek; namely, the reinforcement of traditional values The Waltons represent."